Enter your preferred new password in the New password and Confirm password box. HTML editor: An HTML editor is available for use in some sections of the site. This is known as a ‘What you see is what you get’ (WYSIWYG) editor. It allows you to apply formatting to your text like in a word processor. If the editor is turned off you can only enter plain text. If you do not have this option, the site administrator may have disabled it. Language: If your Mahara instance is offered in multiple languages, you can choose in which one you want to navigate the site. The menu items and the contextual help appear in the language you have chosen. However, the content does not automatically switch into that language. You only see this option if there are multiple languages available. Show controls to add and remove columns when editing a page: You can add the Add and Remove buttons in the page editor to quickly change the number of columns in a portfolio page, see edit layout. Enable multiple journals: By default, you have one journal. If you would like to keep more than one journal, choose this option. 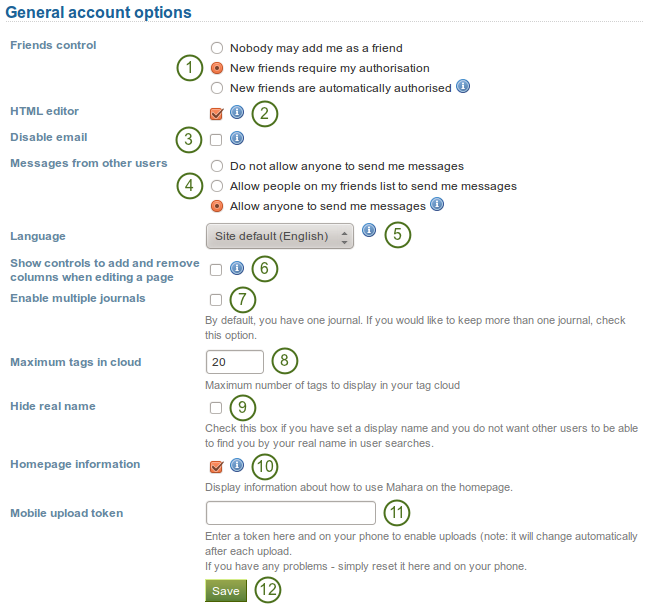 Once you have chosen this option, it will disappear from your accounts settings page unless you only have one journal again. Mobile upload token: Enter a token, e.g. a word, here and on your Android phone or iPhone to enable uploads. Your token changes automatically after each upload. See Mobile Mahara for more information on using Mahara with a mobile device. The site administrator must have allowed mobile uploads for this option to be displayed.